Miles: 25.9 miles (41.7km), from mile 1,302.9 to Highway 36 at mile 1,328.8. Health: Tired and sore. Legs still feel yesterdays climb. Our goal for today was to get to Chester as quickly as possible. I wanted to catch up with Dandelion, Fire Ant, and Roadrunner who somehow had passed us a few days ago. This meant we had to do almost 26 miles (41.7km) before the evening and hitch to town. Usually, this wouldn't be too hard, but last night we got to bed way too late, meaning we had very little sleep, and we were still sore from the long and brutal climb up and out of Belden. My alarm went off at 4:45 am. We talked through our shelters which we pitched only inches from each other on the small patch we found last night in the dark. We packed our gear, ate breakfast, filtered water from the spring, and started hiking. My legs felt sore and like they didn't have their usual spring on them. We wobbled on until our muscles warmed up and then increased our speed and pace. Instead of talking, we just listened to music and moved through the forest, watching the smoke from the wildfires still filling the valley below us. When we spoke, we jokingly complained about the trail and how tired we were. It didn't take long for the sun to heat up the air and make the hiking even more miserable. I wasn't enjoying Northern California at all. It was like the desert, but somehow even hotter, and with views that could be at best described as "meh". I felt like the trail designers had noticed that there was not much to see here, and decided to go back to making the trail do unnecessary loops around every possible hill, adding tons of PUD’s (Pointless Ups and Downs). We would first start by going north, then do the same distance back south, then turn east, then to west, back to east, and so forth. I feel frustrated, hot, and miserable. As the trail peaks out of the cover of the trees, the sun really starts to beat down on us. I curse the heat and pray for a rain, clouds, or tree cover. I miss my umbrella every day. After a while, the trail gets back under the trees but they provide little protection from the overwhelming heat. I try to eat my snacks while walking but I'm basically drinking chocolate bars out of their wrappers as they all have melted already. Despite all of this, we reach our first water source and lunch spot early. As most of the water sources on this section, the spring is about 0.3 miles off-trail, down in a deep gulley. We climb down and find a nice, shaded spot to sit in. We eat our breakfast and talk about all the milkshakes and pizzas we would eat once we reach the town. After I've eaten I feel really tired and relax a little. The next thing I know, I wake up and see Sam sleeping where he was previously eating and an hour has passed by. I feel better after the little nap, but we lost an hour of hiking time, and we're still very tired. We need to get moving as the sun has turned around and we're now exposed and sitting in the burning sun. We have about 16 miles to the road, and only 9 miles to the PCT midpoint, our highlight of the day. We take more water with us as the water sources are scarce on the next section, and then climb back up on the trail. It's even hotter now and my temperature meter shows around 100 degrees (39c) in the shade and maxes out in the sun. Ugh. Even though my body has already accustomed to the hotter climate, this kind of heat is too much for me. We do more pointless climbing. We climb up on a hillside only to climb back down to the elevation we began climbing from. We’re not even climbing over anything, we’re just walking up and down on the same hillside to gain and lose elevation for the fun of it. I curse the trail designers in my head. I guess this is how you inflate those elevation metrics for the trail. Usually, I can do about 5-10 miles on the 0.75 liter bottle I have on my shoulder pouch, but today I have to stop mid-climb to filter more from my reserve bottle. Even though I'm doing good mileage, I'm not enjoying the trail at all. It's no wonder most people quit at this part of the trail. 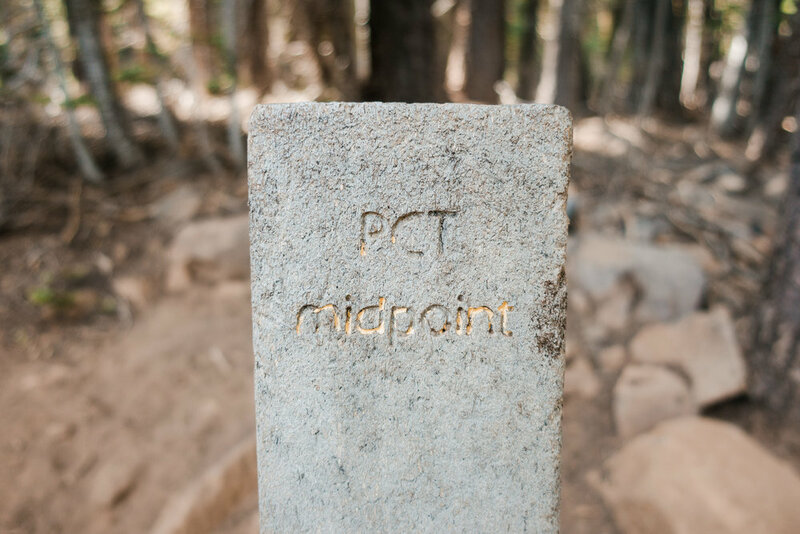 The last miles before the PCT midpoint go by so slowly. I've fallen behind of Sam and can't see him in front of me anymore. I start to get really close to the midpoint and take out my camera, expecting to soon see Sam waiting for me. Instead of Sam, I see a baby deer as she stares at me from the trail, and then runs off with her mom. As the deer move off the trail, I see the midpoint marker right behind them. But no Sam. We've done this much already. We still have this much to do. I rush to put my hand on the marker and let out a little yell. I guess Sam had gotten tired of waiting for me and hiked on. I write my name on the trail register and take few photos. As I'm taking these, I hear noise from the trail and see Sam walking down towards. Somehow I've managed to pass him without noticing. 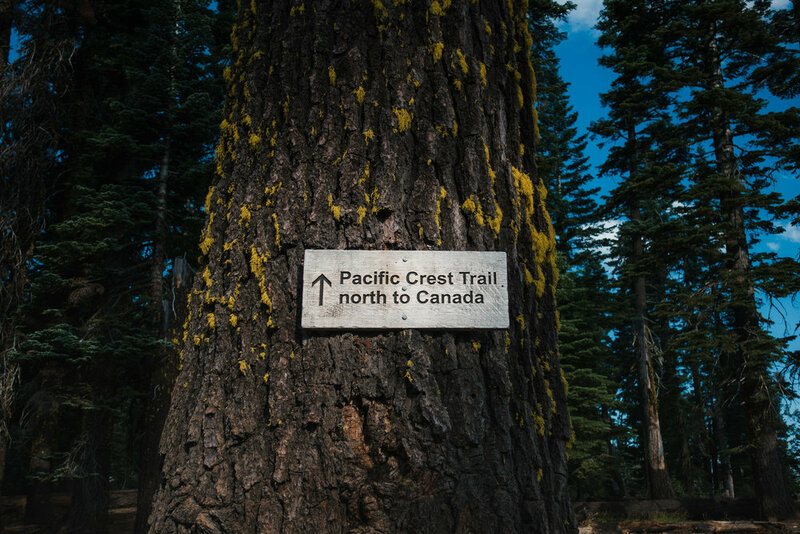 We celebrate reaching the PCT midpoint and take tons of photos. Reaching the midpoint is our biggest accomplishment so far. 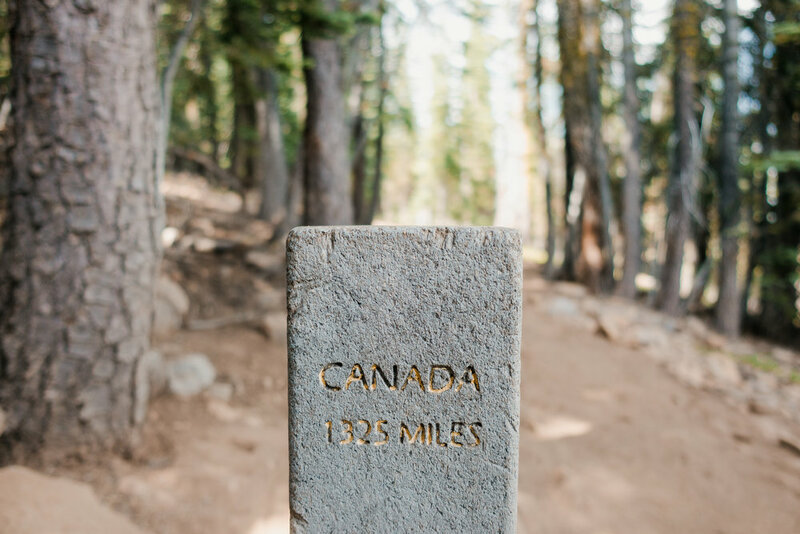 We've hiked halfway from Mexico to Canada. At the same time, it's has a bittersweet aftertaste. We've only hiked halfway. For me, at this point, I've spent three months and a day on the trail and I'm only halfway through. 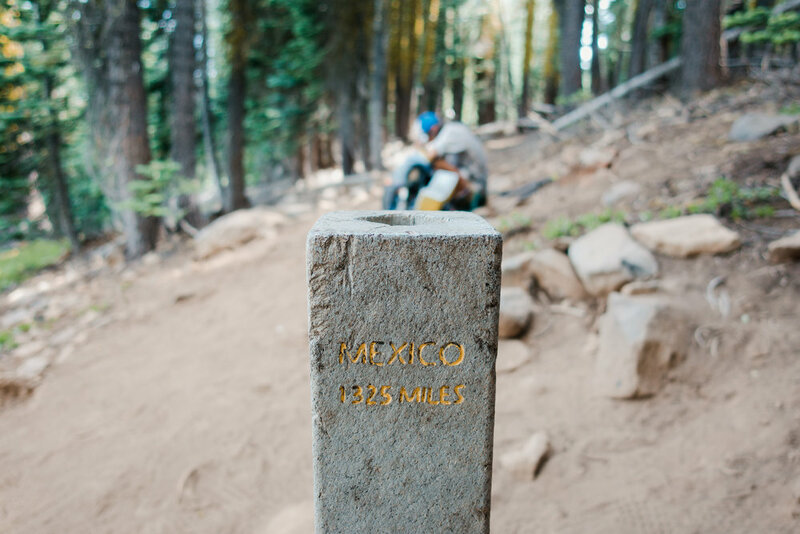 I think back on all of the miles we did in the desert, and through the snowy Sierra, and how long those felt. And I still need to do the same amount of miles, but in less than two months, to reach Canada before the end of September and the coming winter. I feel like this point underlines how long the trail really is. Happy to reach the halfway point. And when you realize you're only halfway done. After we're done with celebrating and taking photos, we shoulder our packs and start hiking again. We're late on our schedule and will get to town late in the day. I'm almost out of water and Sam is low as well, and the next water source is almost five miles (8km) away. We need to boogie. We still do good time moving down the trail but it just doesn't feel good. I complain to Sam about Northern California most of the way down and he keeps laughing while walking behind me. After a long rant, I start to feel better but still tired. We both agree that this has been one of the worst days on the trail. The last mile to the water source goes by way too slow. I check the GPS and it says 0.6 miles. We walk for what feels like an eternity and I check again. 0.5 miles. Oh, come on! As we finally reach the water, we quickly filter some water, camel up, and then keep hiking. We want to get to town so we start flying down the trail. Sam writing to the trail register. To finalize the day, the trail decides to treat us with a half a mile of overflown, muddy section of the trail, right before we reach the road. It's so much more fun to try to hitch to town when you’re covered shin deep in mud and have wet, smelly shoes on. Even without the mud, we are a pretty dirty sight. Once on the road, we soon get a ride to town and get the ride straight to the milkshake and burger place in town. We eat burgers and drink the massive milkshakes. I get a message from Fire Ant telling that they didn't stay in-town and instead went directly back on the trail. Roller has gotten back on the trail as well and heads out with the others. I also hear that Sunshine has stayed back in Quincy for few zeros with her friends. That explains why we didn't see her name on the trail registers. While Sam stays in the restaurant, I run across the road to see if the hotel has any empty rooms. They have only one suite but I manage to Yogi the price down to what a regular room would cost. We’re sleeping in style tonight! After eating we get to our hotel, wash our gear, take showers, and vegetate on our beds watching TV while planning for tomorrow and the next section of the trail. I need to get to the Post Office early in the morning to get my Amazon order. Finally, I get the bigger battery bank and I’m able to edit photos and videos while on the trail. I also ordered a new spoon as I hate the Vargo spork I bought in Kennedy Meadows. I have to bounce my bounce box to Ashland as I have no need for my rain gear, thermals, or mosquito net now. I also need to find a new hiking shirt as the one I'm currently wearing doesn't breath at all and I'm just suffering every day on the trail. But that's going to be hard as there are barely any shops in town. I lean back on my large bed and enjoy the feeling of being clean and being inside where there's AC. Sam cranks the AC down and soon it's as cold as it’s in Finland but I can't complain. Sure beats sweating outside. After not showering and being in towns for 238 miles (383km), it sure feels great to be back in civilization.